300+ built-in stunning filters, overlays, effects, elements, etc. The recently updated features of Facebook allow users to update all new stories of life on profile in much interactive way. You can show a different world to all your viewers with 360 videos and photos. You will be glad to know that Facebook is now compatible with VR headsets that were earlier limited to Oculus Rift etc. It is time to get started with new experience to enjoy 360 videos on your own Facebook Profile. Most of the cameras these days are capable enough to capture shoots with 170 degree wide coverage and in case if you want to show the scene behind the camera then it becomes essential to use two 170 degree FOV cameras back to back. Hence, for capturing all six directions in a single footage you may require connecting 6 cameras together while adjusting their focus in different directions. The resultant content is known as 360 degree video. Many smart algorithms have been developed by professionals to get these videos stitched together to develop complete 360 degree content in a single footage. This is something like standing in the centre of a sphere and viewing everything in all directions. These 360 degree videos have inspired the concept of virtual reality but these equipments are quite expensive. But as soon as the technology is gaining popularity, chances are to get VR gear at lower price in near future. So, now you may be thinking hard that how this feature is useful for Facebook users. 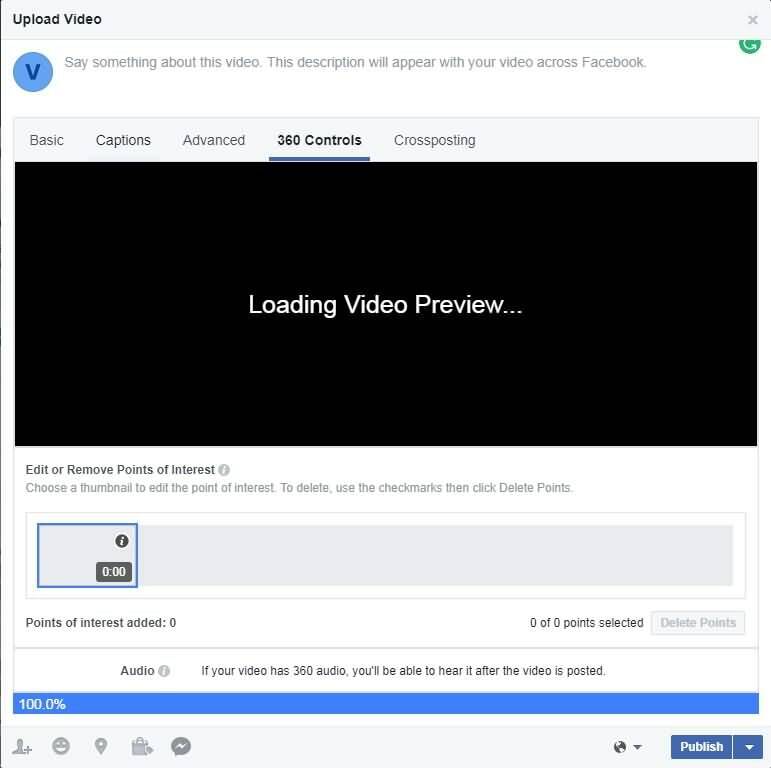 Actually, Facebook has recently enabled its users to upload 360 videos directly to their pages, groups or profiles so that audience can stay engaged. This is really interesting. How to make a 360 Degree video on Facebook? All these cameras are capable enough to develop 360 degree footage with ease. Most of the reviewers till now have recommended 360Fly for Facebook 360 videos due to its compact size and handy features. Its performance is somewhere linked to GoPro quality. This camera unit is currently available in two models: 360 Camera with 4K ability at $356.69 and 360 HD camera with price tag of $219.95 only. This camera can easily develop Facebook compatible content. In case if you are using any other device to capture your 360 degree videos then you may need to make manual adjustments for your 360 video formats. 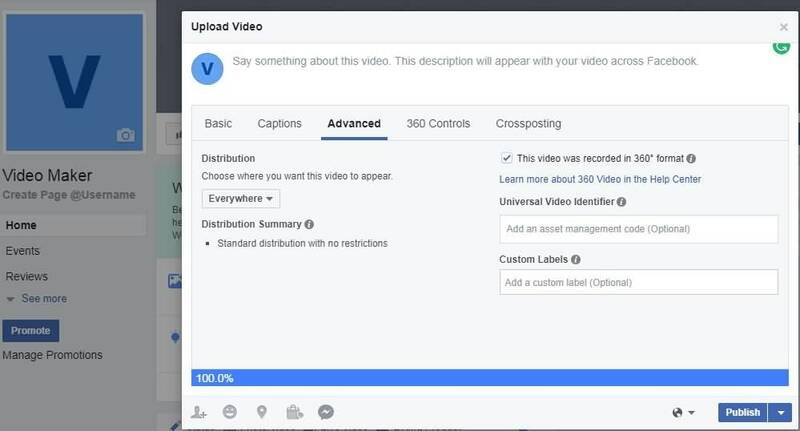 Step 1: Users need to follow the same steps as they usually follow to add normal videos to their facebook pages. Step 2: Before you hit the publish button on your screen, go to the Advanced tab. Step 3: Now select the option “This video was recorded in 360° format”. It will help your app to generate automated control for 360 degree content. Step 4: Go to 360 Controls tab and make settings for field or view as well as more initial camera orientations. Step 5: Finally click the Publish option. Note that Facebook 360 live platform allows maximum 30 minutes for a 360 degree video and the maxim supported file size goes up to 5GB only. So you can prepare your media file accordingly. As now, it is possible to add 360 degree videos on Facebook so people these days are searching for new formats. These 360 degree videos can capture thrills and action from sports games or can show you things that are happening behind the camera. They can also help viewers to explore various beautiful locations throughout the world. You will be glad to know that Facebook 360 is now compatible with Samsung Gear VR device, as earlier it was supposed to work only on iOS platform. So now you can explore the world of 360 videos with ease. How to view 360 videos and photos from Facebook on Samsung Gear VR? Explore: It will help users to discover many interesting 360 videos or photos that are already updated by individual creators or big organizations. Following: It will assist you to go through the 360 content that your friends have recently updated on Facebook 360 app. Saved: With this feature users can get connected to their saved 360 degree content. Timeline: When you are ready to update your own 360 degree videos or wish to go through your earlier updates then visit Timeline.